The Wall Street Journal reported Thursday that the U.S. and its allies are pushing for Iran to agree to lower its allowance of the amount of radioactive material they’re allowed to hold in order to keep President-elect Donald Trump from abandoning the Iran Deal entirely once he takes office. Officials told the WSJ that the talks to adjust the cap numbers started months ago in an effort by the Obama Administration to keep the deal in place and lessen the possibility of the next President taking swift action to completely abolish the deal. While Iranian officials have been involved in the talks they have not agreed to officially commit to any of the proposed regulation changes. Currently under the nuclear deal, Iran is allowed to have a stockpile of 300 kilograms of enriched uranium and 130 metric tons of heavy water at any given time over the next 15 years. Iran has already exceeded the limit of heavy water twice this year alone. It was also revealed that the Obama Administration gave Iran a pass when they exceeded the enriched uranium cap since the signing of the nuclear agreement and agreed to continue to lift sanctions on the Islamic Republic despite not fully complying with the agreed upon cap numbers. Officials also told the WSJ that lowering the enriched uranium cap numbers would increase Iran’s “breakout time” which is the amount of time it would take for Iran to acquire enough materials to fully develop a nuclear weapon. The Obama Administration claims that the Iran Deal enforces enough regulations to keep Iran’s breakout time to be about a year at any given point. President-elect Trump has been an outspoken critic of the Iran Deal throughout his entire Presidential campaign. Trump first said that he would get rid of the deal entirely until he later said he would likely renegotiate it. 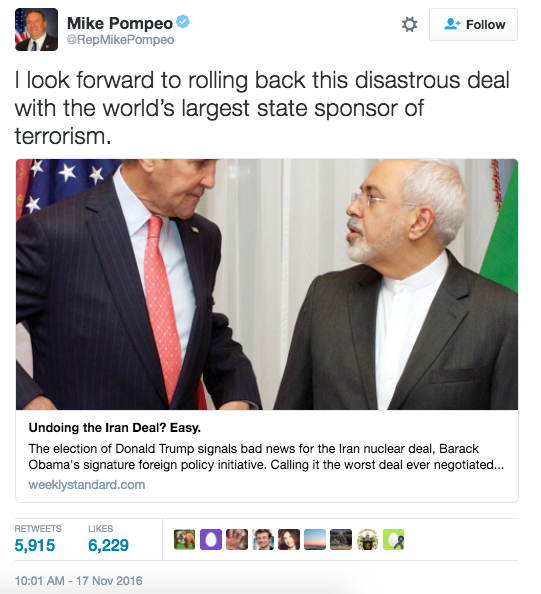 Congressman Mike Pompeo, who was just announced to be the CIA Director in the Trump administration has been an ardent opponent of the deal as well, and was among the lawmakers to first discover the existence of the secret side deals made between the U.S. and Iran giving Iran a pass for not meeting the required stockpile cap numbers. Last week, Iran’s Supreme Leader Ayatollah Khamenei threatened that if the United States extended sanctions on Iran for another ten years that Iran would take action and retaliate in some capacity. “The latest is extension of sanctions for 10 years, that if it happens, would surely be against JCPOA, and the Islamic Republic would definitely react to it,” Khamenei said.